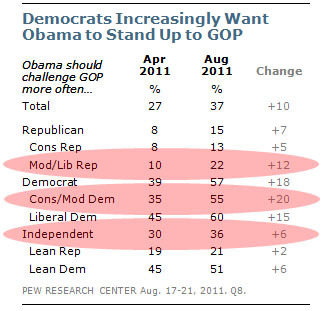 non-trivial numbers of Republicans say that Obama should stand up to the Republicans. He’s right. It’s no surprise that liberal Democrats increasingly want Obama to fight back against Republicans, but that’s not the real story here. The biggest shifts in attitude have come from the center. Take a look at the circled parts of the table: the entire middle of the political spectrum — liberal Republicans, independents, and conservative Democrats — is speaking pretty loudly here. They want Obama to fight back harder against the shouters in the tea party wing of the GOP. As Chait points out, Obama is walking a tightrope: if he does get more confrontational, he risks losing ground in the areas where he’s still viewed positively (trustworthy, well-informed, cares about people, etc.). But he better figure out how to walk it. His entire electoral strategy is based on winning the middle, and the middle is getting fed up. You can see the full Pew poll here. It’s interesting reading.